This is the photo that sparked it all. I love the black and white color scheme. The fireplace and the hanging swings are such a gorgeous combo. I'd be out here with a cup of coffee every morning if this was my backyard. If this is your home please invite me over! If you don't follow Three Birds Renovations you are missing out. These Aussies are the cutest things to watch on their YouTube channel. I love follow their updates and blog posts. 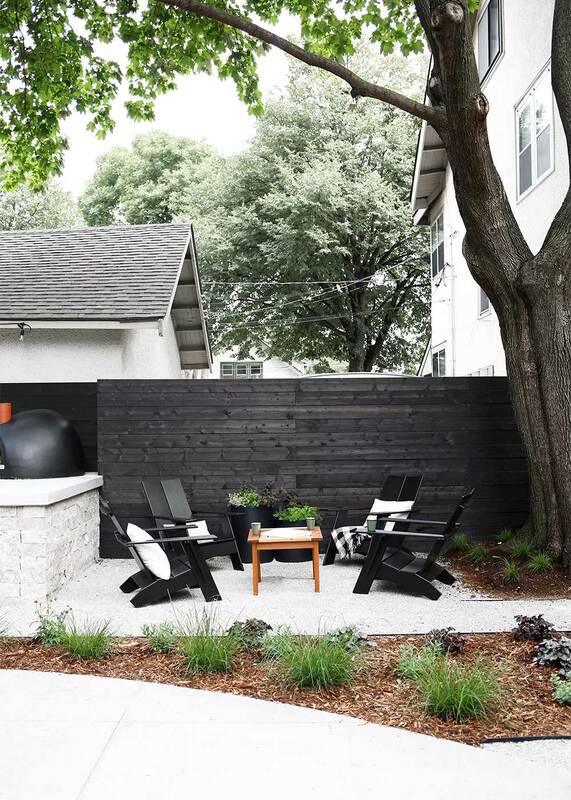 I love this Minnesota Modern Backyard by Faux Martha. Melissa links all the resources to create this space for yourself. I love the black horizontal fence. Not only will you be inspired to create a beautiful space by this blog, but she'll also has AMAZING recipes that will make you host of the year. For more outdoor inspiration, make sure to follow along on Pinterest I hope it inspires you to create an outdoor space you love! Leave ideas you have in the comments below. We love to hear from you, friends!